Chicken food menu is a food that almost everyone must be with various preparations, but for those of you who are currently used to cook the chicken just by frying it I give a new way with the fuel technique. 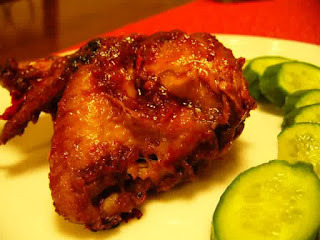 Create culinary lovers also surely like the name of roast chicken nah then from that here I will give recipe chicken. Lemon Chicken Recipe Lime is a new creation that will make your appetite increases with the taste of lime in grilled chicken. Well you are impatient ya want to know the the appropriate way and what are the ingredients needed for available good food and delicious to eat. Listen and note the info I entered this. Soak Chicken In Orange And Salt Water For 30 Minutes. Set aside. Stir-fry Onion Red And White That Has Been Purified Together With Orange Leaf Fragrant. Enter Chicken, Stir until Color Changes. Add Sweet Soy And Sauce. Stir to Half Mature. Bakar Together With Lime Lime Up To Mature.